This section is a bit of a mish-mash. There are personal blog posts, as well as samples of other kinds of writing that I do: media releases, articles and longer-form essays, show reaction posts, and so on. You can filter the posts by clicking the tags I’ve linked in the previous sentence, or just scroll down to see everything in chronological order by date. I also maintain a semi-regular travel blog here. There are no samples of my work as a grant-writer posted here, because that material belongs to the clients for whom it was written. If you have questions about what I can do in that area, please contact me directly and we can talk! So this morning I did some research and then I wrote a letter, because writing is the tool that I have. I’m copying it here in case anyone finds it helpful; I know the reading I did of other peoples’ posts and articles (some links below) helped me cram yesterday’s flabbergasted anger into something more coherent. I also made a donation to the NAC Indigenous Theatre section (see link below), because disposable income is another tool that I am privileged to have at the moment, even if I don’t have much of it. During my undergrad years at McGill, I was a member of a Faculty of Music choir simply called University Chorus, which at that time was under the direction of an amazing conductor named Iwan Edwards. It was a mixed choir of about 100 voices, mostly music students. I sang with them for three years and had some of the great musical experiences of my life. We learned and performed all kinds of repertoire – lots of classics, like Beethoven’s Ninth Symphony and Mendelssohn’s Elijah and Orff’s Carmina Burana, but also many things that were more off the beaten path. One of these was Ernest Bloch’s Sacred Service (Avodath Hakodesh) – a setting of the Jewish (reform) Sabbath morning service, for baritone cantor with full choir and orchestra. Bloch wrote it on commission for the congregration of Temple Emmanuel in San Francisco, and it premiered there in 1930. The whole work is just under an hour long. When University Chorus learned it, we performed excerpts from the first five movements, and the sixth one, the Benediction, in its entirety. This last short movement was my favourite, and I still listen to it often, 20 (!) years later. I hear it differently now than I used to, though. So I’ve been pretty ambivalent about patriotism since my early 20s, when I was a historian-in-training and the study of nationalism was more or less my field. As a theoretical concept, it does NOT hold up well to any kind of scrutiny, trust me. And in practice? It’s downright dangerous. To whom? Well, to everyone, ultimately. But most obviously and immediately, to anyone considered “other”, anyone on the margins, anyone struggling to fit into whatever arbitrary (and, if we take the long/historical view, probably temporary) border has been drawn on the map – or in society – at any given moment. Vancouver’s Edith Wallace celebrates the launch of her new double album, First Bloom, with an intimate concert that showcases her many gifts as a singer-songwriter. It’s a rare performer who can connect the way Edith does with her listeners, combining superlative musicianship with raw emotional courage, warm and wide-open honesty, and belly-laugh-inducing humour. Being at an Edith Wallace concert is like taking a seat at her kitchen table, having a cup of tea and talking about life; you’ll laugh and cry (sometimes both at once), listen with your whole heart, and walk away a little wiser. Edith’s music is beautiful, challenging, wise, hilarious – and ultimately full of joy. This February, Vancouver-based musicians and composers will collaborate with virtuoso soloists from Turkey, Armenia, Lebanon and Iran, and visiting Canadian ensembles from Victoria and Montreal, to present traditional, contemporary and intercultural music of the Middle East and Canada. Notes From the Araxes Basin promises to be a great musical adventure, guaranteed to expand horizons and transcend borders. I wrote this article on the Vancouver Inter-Cultural Orchestra’s 2015-16 season for the inaugural Vancouver edition of Artslandia Magazine. You can see the article on Artslandia’s website here, or in print – the magazine is available for free at many locations around Vancouver. Diverse, innovative, multicultural, vibrant, Canadian. The Vancouver Inter-Cultural Orchestra (VICO) is a professional concert orchestra devoted to performing intercultural music on a grand scale. Founded in 2001, it was one of the first such ensembles in the world, and is the only one of its kind in Canada. So you’re putting on a Christmas concert. You have a group of amazing singers, and a list of songs that they will sing. All you have to do is put them in order, and hey presto – you have a show! Right? The Vancouver Inter-Cultural Orchestra launches its 14th season with Chrysanthemums & Maple Leaves 2014. This innovative festival celebrates the music of Japan, and explores interactions between Japanese and Canadian cultures through educational events, workshops, chamber recitals and orchestral concerts in Vancouver, Victoria and Burnaby. So, somehow – I have no idea how – I got on someone’s list, and I was offered comps to the opening night of the Vancouver Symphony Orchestra‘s 95th season at the Orpheum on Saturday, Sept. 28th. It was a lovely, unexpected surprise, like someone just decided to give me a present out of the blue. I’m not sure who to thank (apart from the VSO’s marketing department, maybe? ), but I’m very grateful. Here’s the thing: although you wouldn’t necessarily know it by looking at the work I do now…in a lot of important ways, I cut my artistic teeth on classical music. From middle school onward through to the end of my undergrad degree, I spent enough time in a succession of bands, youth orchestras, concert choirs and chamber ensembles that music was like my part-time job. It was also my home away from home, the safe place where I knew I would always find my tribe, the thing that injected colour and drama into in my life, stretched my imagination and made my heart sing. When I hear the chorus of “At the Ballet” from A Chorus Line, the part that goes Up a steep and very narrow stairway… I don’t think of a dance studio. I think of my clarinet teacher Joy Skrapek’s little apartment on Bay St. in Ottawa, where I went every week for lessons from my grade 8 year until I graduated from high school and moved to Montreal. During my undergrad I didn’t have very many opportunities to play my clarinet, but I kept singing. I auditioned for and got into the McGill University Chorus, and had some of the most thrilling performance experiences of my life under the direction of a genius conductor named Iwan Edwards. So, Justin Trudeau was recently elected leader of the Liberal Party of Canada. The Conservative party immediately launched a campaign to undermine his image, in which they were condescending about (among other things) the fact that he was once a drama teacher, and before that a camp counsellor. A lot of folks said “Oh for Pete’s sake, so what? None of this is relevant to his current ability to lead the country!” Meanwhile, anyone who had ever actually taught drama or been a camp counsellor was thinking Um, wait a minute, YES IT IS. Joanne Kates, the director of a residential summer camp in Ontario, lays out all the reasons why in this amazing article. Speaking as someone who spent four consecutive summers as a camp counsellor, doing musical theatre with kids ranging in age from 4 to 14 years old…yes. Yes to all of that. Sure, it was a fun, rewarding job, and I loved it. But it was also incredibly hard work: a daily lesson in responsibility, diplomacy and leadership. This post is not about Justin Trudeau, though. It’s not even about why being a drama teacher and/or a camp counsellor might actually be pretty good training for some aspects of being Prime Minister. It’s about a coincidence, or possibly an instance of a phenomenon I like to call “iTunes Shuffle Can Read My Mind.” Every so often it will happen that I’m on the bus or walking home, listening to some playlist or other on shuffle, and a song will start to play that is really, completely, eerily appropriate to whatever I am thinking about at that moment. Usually it’s a song that I haven’t heard in ages, one that I might have actually forgotten I own – but iTunes Shuffle remembers, and somehow knows that the exact right time has arrived to play it again. In this case, I was thinking about Trudeau and the whole drama teacher/camp counsellor kerfuffle, and iTunes Shuffle read my mind. It played the title song from Disney’s Beauty & the Beast. It was a closing night for the record books, that’s for sure. The show? Us & Everything We Own, a new play by Sean Minogue that finished its world premiere run last Saturday April 13th, at the PAL Theatre. At about an one hour before curtain, the house tech and I were starting our pre-show checklists, and the one actor who was back from dinner break had just begun to warm up on stage. There was a sudden “powering down” sort of noise and all the lights went out. After a few seconds of total darkness, the emergency generators kicked in, and some of the work lights over the stage flickered to life. We opened the heavy curtains that line one wall of the theatre and looked out over Coal Harbour. It was still daylight, and we could see people in neighbouring buildings doing the same as us, looking out their windows or coming out onto their balconies to assess the extent of the outage. A call to BC Hydro confirmed what we already suspected: the power was out, not only at PAL and surrounding buildings, but across a significant swath of downtown. Estimated restoration time: 9 pm. I wrote this for the alumni newsletter associated with the graduate residence where I lived for two years while completing my MA at UBC in 1999-2001. Green College was and continues to be an inspiring, amazing community; for me, it was – entirely unexpectedly – one of the places where my journey towards a career in theatre started. This is part of that story. That was my Facebook/Twitter status on March 7th, as I sat in the Coach House waiting for the show to start. Several friends from my time at Green College – now scattered across the world – immediately chimed in with variations on “oh wow, that’s great, I wish I was there too”. If they had been, I know they would have been as moved and thrilled as I was, both by the production itself and by the memories it brought back. This is an overhaul of a paper I wrote for my BA in history, about 13 (!) years ago. As a sort of personal writing exercise, I have attempted to recast it for a general audience, aiming for a more informal/less academic tone. In addition to stylistic changes, this involved a lot of paring down and the removal of all footnotes, but I want to be clear that the following is my interpretation of work done by many great scholars of Welsh history and culture; they are listed in a bibliography posted below the main text, and I would be happy to be more specific about the exact provenance of any particular bit of information, should anyone be interested. Any errors or inaccuracies are my own, of course. I’m fascinated by the formation of national identity in general, and the role that cultural expression (especially music, and theatre) plays in that process. I’m also a choir nerd of long standing, so I kind of love the idea of a national culture in which choral singing is valued so highly. Wales is famous in particular for its male voice choirs, but singing in general has been a major focus of Welsh culture for at least the past two centuries. 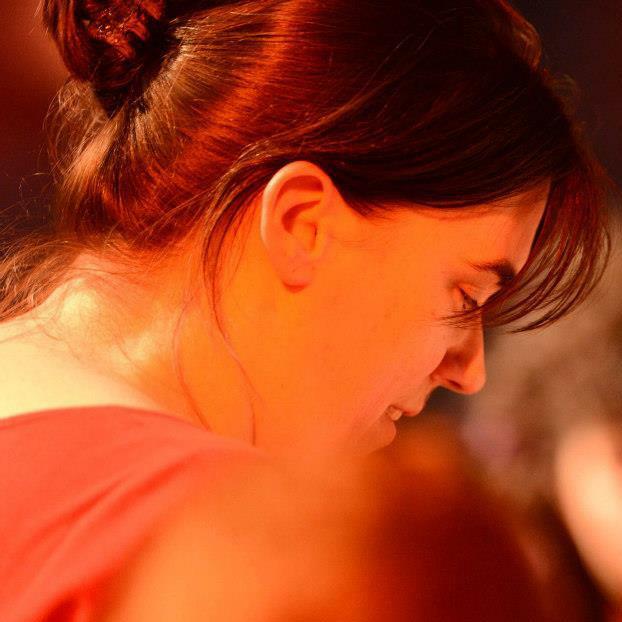 The ability to sing well, with heart and passion, is something that’s widely considered to be a typical Welsh characteristic and a source of national pride – or at least, it was in the late 1990s when I first researched this. I’d be interested to know if that’s still true now (2013). For goodness’ sake, [male characters], please stop telling [pivotal female character] what to do. Why should you know better than her what’s best *for* her? We – society*, I mean – ask such a lot of girls and women, and we’re so quick to judge them when they fall short. It’s exhausting, to say the least. *I can only speak for the one I live in, but I’m pretty sure the same is true elsewhere too. Motherhood, man. What a terrifying proposition. This was my micro-reaction post on Twitter: Wow. An amazing feat of storytelling. Hard to find words – Mark O’Rowe took ’em all to make verses with. The buzz was strong with this show; before I saw it, I had heard many theatre colleagues describe it as brilliantly written, acted and produced, violent and gruesome and beautiful. It was certainly all of that. My micro-reaction on Twitter to this Pacific Theatre production of a new play by Lucia Frangione was “beautiful performances and lots to think about.” If there had been room, I would also have said that I love Lucia’s writing. She’s got a gift for smart, colourful dialogue, and I get a sense that she has enormous affection, or…generosity of heart…towards her characters, even as it’s clear that they are all flawed, struggling people. Leave of Absence was full of gorgeous turns of phrase, and also descriptions that were so powerfully evocative that they were hard to listen to. I can’t quite get a handle on Molière. It’s definitely me though, not him. I think what happened is that somewhere way back, early on (not even sure where or when), I got it into my head that Molière = “classic” French theatre = French bedroom farce in the style of Feydeau or similar…so I go to see his plays subconsciously expecting ridiculous romantic entanglements and mistaken identities, slapstick humour and overall light-hearted shenanigans – and then I sit there feeling jarred by the fact that the comedy is actually satire, and pretty dark at that…the kind that you laugh at because it’s clever and true and familiar, and you also flinch a bit in recognition of the cynicism and rage in it. Forty years ago, Grease opened on Broadway and was a runaway hit! Just six years later, the film version starring John Travolta and Olivia Newton John smashed box office records to become the highest-grossing movie musical of all time. For many, Grease is STILL the word, and brings back memories of rockin’ music, fantastic dancing and, of course, tight black pants! So dig out that poodle skirt or biker jacket and brush up on your hand jive skills; this November, Footlight Theatre is taking audiences back to 1959 with an exciting new production of the ultimate high school musical. Plot synopsis? No need. The classic, hilariously corny storyline – first love, teenaged cliques, fast friends and faster cars – will be familiar to many… and so will the 50s-style pop/rock soundtrack, jam-packed with beloved hits. From “Summer Nights” and “Greased Lightnin'” to “Born to Hand Jive”, “We Go Together” and so many more, you won’t be able to keep from singing along! Footlight’s large and talented cast includes Jennie Neumann (Rizzo), well known to local audiences thanks to her acclaimed portrayals of Tracy Turnblad in Hairspray and Natalie in Next to Normal (both at the Arts Club Theatre). Jennie will be joined by Lucas Blaney (Blood Brothers at the Arts Club) as Danny Zuko, Alex Gullason (Titanic at Theatre Under the Stars) as Sandy, and Craig DeCarlo (Roger in FCP’s Rent) as Kenickie. Footlight’s production is directed and choreographed by Lalainia Lindbjerg Strelau, with musical direction by Tom Arntzen and Monique Creber, set design by John Bessette, lighting design by Phil Guhl, costumes by Christina Sinosich and production stage management by Melanie Thompson. Tickets start at $19.59 (yes, the year the show is set) and are on sale now at http://www.ticketstonight.ca. Don’t miss out! FOOTLIGHT THEATRE COMPANY has been producing quality community theatre in Burnaby, BC since 1965. Recently the company followed smash hit productions of Joseph and the Amazing Technicolor Dreamcoat (2009) and The Sound of Music (2010) with another family classic: The Wizard of Oz (2011). High production values, big talent both professional and amateur, and tons of heart: these are the hallmarks of a Footlight show. Visit www.footlight.ca for more information. We had tickets for 42nd Street, Much Ado About Nothing, A Word or Two and The Matchmaker…and at the last minute I decided to add a matinee of Henry V for myself. In early 2010 I took a brief sabbatical and did a bunch of travelling; one of my destinations was Paris, where I lived for 5 weeks in a tiny studio in the Latin Quarter. I saw a lot of things I’d previously only read and dreamed about, including a show at the Comedie Francaise. The Comédie is essentially France’s national theatre; the company has been in existence, housed in the Palais Royal at the centre of Paris, since the 17th century. Seeing a show on the main stage in Salle Richelieu is kind of like going to the Globe in London; granted, they don’t recreate the whole period experience at the Comédie, and they do all kinds of theatre there from classical to avant-garde…but the physical building is a reconstruction (itself dating from 1900) of the space as it was back in the 1680s, and the weight of centuries of theatre tradition is definitely still in the air. My original intent was actually to see a Molière comedy, for the sheer historical thrill of it and the fact that it doesn’t get any more “classical French theatre” than that, but Le malade imaginaire was sold out for the forseeable future, so instead I got a ticket for Les joyeuses commères de Windsor, which is to say The Merry Wives of Windsor. Shakespeare translated into French…I honestly had no idea what to expect. The Vancouver Inter-Cultural Orchestra brings its 10th anniversary season to a triumphant close with a concert featuring the 25-member ensemble and chamber choir Laudate Singers, premiering major new works commissioned by the VICO from Dutch composer Joël Bons and renowned Canadian composer Dr. Stephen Chatman. The programme will also include a new Canada Council commission by Coat Cooke for intercultural orchestra, and Moshe Denburg’s El Ginat Egoz for choir, erhu, zheng and marimba. Bons, Chatman and Cooke have worked closely with the VICO to create their new pieces, in a ground-breaking commissioning and development project funded by Arts Partners in Creative Development. “Inter-cultural music-making involves combining instruments, musical traditions, techniques and aesthetics from all over the world into a cohesive, artistically effective whole,” says the VICO’s founding Artistic Director Moshe Denburg. “We are one of the only ensembles in the world doing this work on an orchestral scale. Thus, our work is not only to commission and perform new repertoire but also to develop the techniques necessary to perform that repertoire.” Over the past several years, the orchestra has evolved an innovative, interactive workshop format, through which musicians, singers, conductors and composers work together to address artistic and logistical challenges, and “test drive” new ideas. The result is fusion music on a grand scale… from Bons’ contemporary/experimental work for intercultural orchestra and Cooke’s combination of improvisational techniques with written composition (both of which will feature Bic Hoang on danbau, a Vietnamese string instrument), to Chatman’s new setting of The Ruba’iyat of Omar Khayyam, which includes Persian, Chinese and Western elements, and requires the choir to sing a gamut of styles from traditional classical chorales to ragtime. With Imagined Worlds: Intertwined, the VICO presents an ensemble of 50 musicians, performing a programme of intercultural music that truly reflects the diversity, virtuosity and global scope of the artistic community in which it was created. One of the city’s most innovative world music ensembles celebrates a successful first decade on November 12, by doing what it does best: creating and presenting new music by Canadian composers – music that builds bridges between ancient and modern sounds and styles, performed by some of Vancouver’s finest musicians on instruments from all over the world. 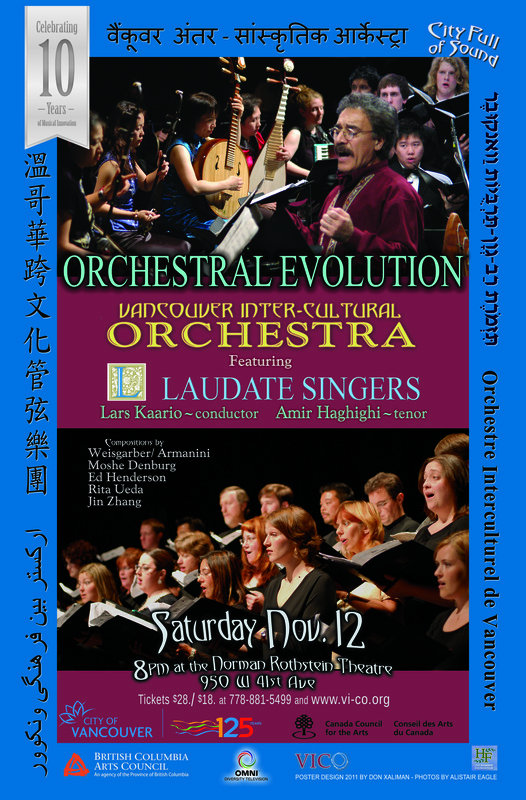 It’s the grand scale of its artistic vision that has always set the Vancouver Inter-Cultural Orchestra apart, so it’s fitting that its 10th anniversary concert will feature the full 24-member ensemble with North Shore-based chamber choir Laudate Singers and Iranian-born tenor soloist Amir Haghighi: 50 musicians in total, who will perform the world premieres of major new pieces by Vancouver composers Jin Zhang, Edward Henderson and Rita Ueda as well as works by Elliot Weisgarber (in a new arrangement by Mark Armanini) and Moshe Denburg. This global outlook will certainly be reflected in the featured repertoire for Orchestral Evolution. Edward Henderson’s new work for intercultural orchestra and choir, Drowned Out – a folk tale, is dedicated to the peoples of the Narmada Valley, India, who continue to protest the ongoing construction of the Sardar Sarovar Dam system. It promises to be a moving tribute to the millions of displaced indigenous peoples around the world. Jin Zhang will take audiences on a journey to Yunnan (a region in southwestern China of extraordinary ethnic and cultural diversity) with his new piece, which grew out of a research trip in 2010, during which he studied the region’s intricate folk music and brought several plucked and percussion instruments back to incorporate into his work. Also on the programme: Yamato no Haru by seminal intercultural composer Elliot Weisgarber, in a new arrangement for choir and intercultural orchestra by VICO co-artistic director Mark Armanini, the premiere of Prayer, a piece for choir and percussion by Rita Ueda, and Dreams of the Wanderer, a major work for intercultural orchestra, tenor soloist and choir by Moshe Denburg, which incorporates settings of texts in Hebrew, English, Chinese and Farsi. Orchestral Evolution is the final event in the VICO’s fall “City Full of Sound” series, produced in partnership with the City of Vancouver as a celebration of both the VICO’s 10th anniversary and the city’s 125th. “City Full of Sound” was designed to showcase Vancouver (past and present) as a city of wonderful diversity, a place that is uniquely equipped to foster adventurous cross-cultural collaborations. Only in such a city – one built of immigrant communities who not only tolerate but celebrate each other’s differences, one that is home to a world music scene internationally renowned for its diversity, possessing a deep pool of talent and artistic innovation – could an ensemble like the VICO, Canada’s first and only professional intercultural orchestra, have grown and thrived for ten years and counting. “City Full of Sound” is presented by the VICO with support from the City of Vancouver’s 125th Anniversary Grants Program.